For hydration: When you meet your specific water needs, you will enjoy the benefits of staying hydrated, like maintaining the right body temperature, helping your cardiovascular system and assisting in the cleansing of toxins. You will have more energy and help each of your organs do its job better when they are getting enough water. Cucumber water adds that little something extra to regular water that makes you more likely to drink it more often, helping you stay hydrated each day. For the best results make sure you are using purified or spring water to avoid the intake of contaminants. It brings down blood pressure: Keeping your blood pressure in check is important because it will help keep you away from debilitating diseases like stroke, heart attack, kidney disease, or vision loss. By drinking cucumber water you stay hydrated, and help your blood pressure thanks to the 4% DV of potassium cucumbers contain. Since they are essentially free of sodium, you will get the maximum benefit of this important mineral if high blood pressure is a concern. Just be sure not to go overboard with your water intake. It soothes the skin: Staying hydrated will help your skin stay supple and smooth, and adding in cucumbers to your water intake means you are getting extra nutrients that help even more. Cucumbers contain silica, which provides extra benefits to the skin. You can also use the cucumbers after you have finished the cucumber water. They are great for helping to calm irritation caused by acne or other blemishes. You will be helping your skin from the inside, as well as topically when you add cucumber water to your skin care routine. Helpful for muscle tissues: Whether or not you are trying to put on muscle, helping your muscles stay strong is a good idea. The same silica in cucumbers that helps the skin also helps your muscle tissues healthy. It is a great choice if you have added a strength training regimen to your healthy lifestyle, or if you want to make sure that your muscles have all of the nutrients needed to function at their best. A daily glass of cucumber water makes a great contribution to the overall health of your muscles, and your body in general. Weight loss: If you are trying to lose weight, replacing sugary sodas, sports drinks, and juices with cucumber water can help you cut some serious calories from your diet. 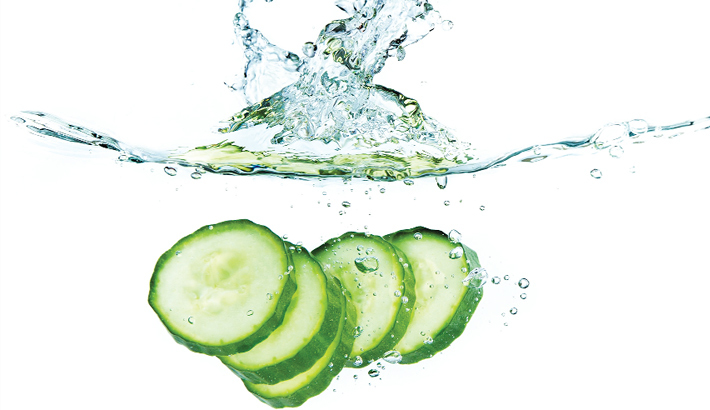 Cucumber water helps quench thirst and keeps the body from mindlessly craving sugary drinks that are high in calories. This is an easy way to effortlessly cut calories out of the diet. Cucumber is also a mild diuretic, which will help with bloat and flush out excess water weight. Plus, the additional water in the diet will help remove harmful toxins from the body and promote optimal nutrient intake.